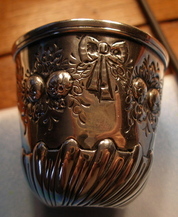 This is a small cup measuring just 1 5/8" tall and has marks which are shown below. 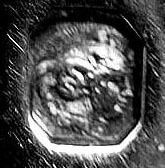 The P with a crown appears to be either Paris 1779, 1775, or 1729 and the A (which is struck twice and in either case is not fully struck) seems to be a charge mark for Paris from 1727-32. This is all from Tardy. Am I correct is thinking that the 1729 date is correct since that coincides with the charge mark. The charge mark of course is not fully struck and I am guessing that it is the 1727-32 mark. Some have told me this was an early wine taster; however all of those I have seen had a large surface so that one could smell the wine easier. I have always used this as a small shot glass. I read the explanation of charge and discharge marks in Tardy and I am still confused. Can anyone point me to a clearer explanation? Well, the old French marking system worked like this. Say a silversmith wanted to make a cup. First he would roughly fashion it into shape and apply his mark. Then he took it to the commune, or guild, where it was tested to make sure that it was of legal fineness. If so, the Guild Warden applied the "jurande" or date letter (which varied from year to year until it was fixed at "P" for Paris 1784-1788). Then he took it to the local tax farmer, who weighed the piece, charged the smith with the appropriate tax and applied the "charge" mark. Then - and only then - could the silversmith return the item to his shop to complete it. Once finished, he was required to return it to the tax farmer where it was again weighed and any difference recorded and reconciled with the tax paid (or due), whereupon the item was struck with the "discharge" mark to show that the tax had been fully paid. The piece could then be sold to the consumer or turned over to the patron who had commissioned it. Therefore, any legitimate ancien régime piece should have four different marks and moreover, they should look like they were applied at four different times, as indeed they would have been. Also, the first three marks - being applied to an unfinished piece - were struck forcefully and deep to withstand the rigors of further working and polishing. The dischrge mark is often timidly struck in an obscure spot, at it was struck on a completely finished item. All this by way of saying that I strongly suspect your marks are not genuine. Neither the "A" nor the "P" resemble any authentic old French mark. Late 19th & early 20th century German & Dutch makers were known to use "pseudo" marks in imitation of old French ones. These were not necessarily to deceive (though sometimes they were and often they still do) but rather to enchance the "antique" look of a piece. On the grounds of both style (the decidedly Victorian looking floral garlands) and construction ( the bottom appears machine rolled or spun - not cast or hammered as an old item would) I think your item is German, ca. 1900, probably from the city of Hanau, where they specialized in this sort of "Historical" style, as it was called. Thanks for the wonderful clarification and information. Is the fouth mark what is called a "Bigornes" and is that what should be on the backside of one of the other marks? No, the four marks are: 1) the maker's mark; 2) the "jurande" mark [a.k.a the year letter or warden's mark]; 3) the charge mark and 4) the discharge mark. Bigorne marks only appear after 1819. It does appear opposite the hallmark, but only on the marks used 1819-1838 and (a different bigorne) 1838-present. It does not appear on French silver made before that, so it would not appear on ancien régime (i.e. pre-1798) marks. Just so there is no misunderstanding, Paris pieces had 4 marks, but this was sometimes not true of other areas of France. You could therefore find French 18th century pieces with only two marks. Of course this piece is not one of them. Thanks again for the understandable explanation as I should have noticed the four marks from your first response. The use of a countermark has always fascinated me and I think the spoon below has one. These are pictures of a small stuffing spoon about 10 �" long with a monogram on the back. It has interesting marks with Hyde & Goodrich and an eagle over W & H and the letter F. I believe this was made by Wood and Hughes and retailed by Hyde and Goodrich. Use of the letter F is not clear to me as normally the Wood and Hughes mark of this type has a head at the bottom. What I am really interested in this thread however, is the mark just below the H in Hyde. 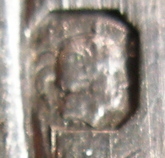 This is a head similar to that shown on page 197 of Tardy and on the reverse of where this head is located is the last mark shown and this mark looks like the remains of an insect. (Perhaps a bigorne) Could the head and the last mark be import marks from France? If that is the correct it would suggest that the owners went to France with their silver and had the French authorities check their silver. items with both the French mark and American marks are made in France and sold in the USA. that these items were made in the USA and imported and marked in France. Both arguments have their inconsistencies. If you argue the first you have to explain where the French maker’s mark is (they are sometimes there, but so far as I know never on New Orleans pieces). Of course they could be overstruck, but there has never been any evidence for this, and finally there are French pieces that weren't marked by the maker. But then why two American marks?. If you argue the second, then you get into the first standard problem. France used the first standard .950 fine, and the second standard .800 fine, you should find either a "1" or a "2" to the right of the head. 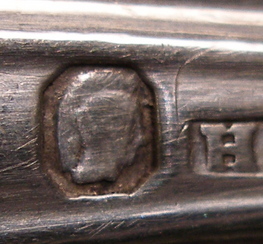 Since H & G or W& H would have made silver in coin silver or roughly .900 fine, they should always have been marked with the second standard mark. This is not the case, in fact it is rarely so. I think I could argue either case, and maybe show at least one piece that would "prove" one theory, and a second piece that would “prove” the other. The only solution I could come up with is to actually test known pieces to see if those with the first standard mark are in fact .950 fine. I don’t know anyone who has done this. For what it is worth, my interpretation would be that Hyde & Goodrich retailed the spoon, having obtained it from Wood & Hughes, who supplied many firms outside of New York. I would guess that Wood & Hughes used the F to indicate French origin, and that they imported it from France. The only other interpretation which I could think of, which is rather unlikely, is that the French marks are imitations, intended to convey the impression of a French origin. I would be surprised if either Wood & Hughes or Hyde & Goodrich would have engaged in such duplicity. 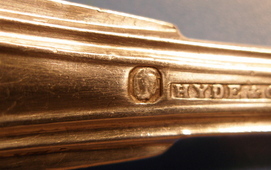 It is far more likely that, with the French history of New Orleans, there would be a ready market for silver in the French style (which this spoon is) and that Wood & Hughes was able to supply such silver to Hyde & Goodrich, perhaps contracting for it directly, which might explain the lack of a more complete set of official marks. This is quite a puzzle, I agree. Being in New Orleans, I have seen my fair share of Wood & Hughes/Hyde & Goodrich silver, and I confess that a spoon marked with both names and a French mark is a new one on me. It may have been reported, but I think I can say – having dealt with silver in New Orleans for 20 years – it is far from common. I’m afraid I can only add some speculation here. Next, under the second scenario, in addition to the standard problem is the import mark problem. France had import marks since the Revolution and while I can see French-made pieces leaving France without the export mark (as noted above and later on), it’s hard to imagine the circumstances under which they would have imported a piece from a country who did not work in their standards and then put their national standard mark on it. They had marks specifically for foreign items which were above .800 but not of French fineness and, by all accounts, were pretty scrupulous about using them. Because of this, I really don’t think the second scenario is viable at all. Third, the spoon is definitely “French” style fiddle thread – the short fiddle, slender shoulders, pointed tip and, above all, robust size – are all characteristic of the favored style of this pattern here in New Orleans in the mid-19th Century. Everything I’ve ever read – and my own experience – tells me that none of this (at least that retailed by Hyde & Goodrich) was made in France but rather specially made in the north for the New Orleans market. I’ll add here that I have seen French maker’s marks alongside New Orleans retailer’s marks (and sometimes overstruck by them), but almost always these were earlier in the 19th century and by what are called the “Creole” silversmiths: i.e., those of French descent. Again, I’ve never seen this on a Hyde & Goodrich piece; I have always heard and believed that they simply did not directly import goods from France. So “common wisdom” suggests that this spoon is American made in the French style, specifically by Wood & Hughes for Hyde & Goodrich and the New Orleans market. (Could the “F” be a factory code for “French” or some such designation to indicate this? Has anyone seen this mark on non-New Orleans retailed pieces?) And this begs the question: why the Minerva head? So the likeliest scenario (in my opinion) is that spoon is, in fact, French and imported by Wood & Hughes. The problem here is that if Wood & Hughes was making a special French-style silver for the New Orleans market (which it seems certain they were), why get it from France?. It could pre-date the time when Wood & Hughes were making their own “French” fiddle thread, but the simplest explanation is that it’s what was wanted. So Hyde & Goodrich (who, by all accounts, did not make flatware) goes to their chief supplier Wood & Hughes and asks for pieces of “real” French fiddle thread. Wood & Hughes orders a set from France, and some (or all) of this order when filled comprises items already made and struck with the Minerva’s head. Wood & Hughes over-stamps the French maker’s mark with their own (the “F” for “foreign” or “French”?) but leaves the Minerva’s head to prove its French origin. They then send it along to Hyde & Goodrich who, in turn, apply their retailer’s mark before delivering them to their satisfied (and, by this time, presumably patient) customer. This strikes me as the most plausible accounting for all the marks. I heartily agree that testing the silver for its precise fineness would definitively answer the question as to whether the item is French or American. As Swarter points out W & H supplied H & G with silver. Interestingly enough they supplied H & G with French style fiddle thread and fiddle flatware. The difference between the French and English style, as we all know, is that the English style has rounded shoulders and the French style has slanted shoulders. The F standing for the France is an intriguing idea. I don’t know if I have noted the F mark before. As I think I pointed out, the Minerve mark has never been faked, since the mark and counter mark are so difficult to copy. I have had one piece of silver with an earlier first Cocq mark that was faked, I will try to post that in another thread, but that is easier to fake. The problem with W & H supplying H & G with French made silver is simply one of logistics. I don’t understand why a former French colonial city would order its silver from France through W & H, when ships regularly went back and forth from France to N.O. As Blakstone says W & H backstamped with H & G is not uncommon. I am surprised that he has not seen this combination with a Minerve mark before. I have dealt in N.O. 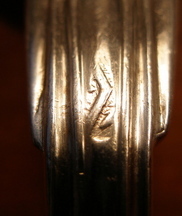 silver for at least 35 years and have had dozens of pieces with either the three sets of marks, or those of H & G and the French mark. I am not sure how many of these pieces were in sets, but my guess is that I have had at least 5-10 examples from different sources. I have discussed this subject with several friends in the N.O. area for at least 20 years. I tentatively add, that some of the piece I have had might have been pre-1838, but I am embarrassed to say I am not sure. Blakstone very accurately reminds us of the Mercury head mark, but I have a personal observance to point out. In nearly 40 years in the business I have seen only a handful, or maybe two, of pieces which had this mark. I personally think it was not used very often. Of course the other comments made about W & H ordering silver are very acute and accurate. While agreeing in connection with French import marks, I am not sure that entirely addresses the problem. I must admit nomenclature maybe has lost me on Blakstone’s discussion of stylistic differences between N.O. silver and French silver. I can say that pointed tips, and robust size, are typical of all French silver, but perhaps you should email me privately for a discussion of this, as I may have misunderstood your meaning. As for the third scenario, I might have accepted it years ago, but I have seen so many of these, and inspected them closely, I just have to reject it out of hand. I will however see if I have any pieces similarly marked still in my stock and be happy to eat crow pie if I have erred so egregiously. If I had to propose a scenario, I really wouldn’t. My best scenario makes no real sense, even to me. I think the answer is hidden, both in the fineness of the silver, and the extent to which we French have followed our own rules. I posted some interesting marks along this vein in the American forum. If I have anymore pieces of New Orleans silver with a Minerve guarantee mark, they are at the bank, and I will post them next week. By an odd coincience, my one reference spoon for this style has the same French marks. The bigorne used before 1838 had randomly arranged insects on a plain background, but the one used after 1838 had the insects aligned between parallel zigzag lines, which, in both of these examples, are the prominent feature. The "second quality" Minerva has a 2 beneath her chin, but the "first quality" one has no number and little room where one would be. I think the marks on the spoon in question are genuine. 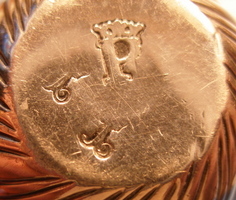 Maurice: my one reference with French makers marks does not have this one - can you identify it? The maker's mark is that of Laurent Labbé, Paris 1829-1852. Thanks to all for your learned comments. Below is a slightly better photo of the insect. It and the head are worn more that the rest of the marks, perhaps because of their placement on the spoon. I also added a picture of the monogram. The monogram is curious to me as it is smaller that I would have done on a large spoon (the spoon is an inch wide at the point of the monogram and the monogram is only 3/8” long and ¼” high). Also the style of letters is not something I am familiar with. I believe the letters are DRB. The curves in each letter have hatch marks of a sort that break up the flow of the letters. Not like the feathering I am used to seeing. Of course this may be a little late for the feathering style. I read the initials as DRP. As I interpret it, what looks like the lower loop of a B is actually the curled "tail" of the diagonal leg of the R overlapping the P.
A bigorne die is like a small anvil; the spoon is placed at random on the surface and struck with the quality mark punch (the Minerva head) on the opposite side. As the bigorne marks struck on each of these examples are centered over one of the zigzag lines, and a variety of insects of different sizes are centered between the lines, only bits and pieces of legs and antennae of the insects are shown. If the spoon were to be placed differently over the die, between the lines, one or more whole insects might be shown. A bit more of the insects show in my example tnan in the other, as the zigzag line is more to one side. These bigorne dies are intended to be protection against forgery; they are so complex that no two strikes could be alike. If any two identical strikes were to be found, one or both would be likely to be forgeries. Well, I have certainly seen it faked, very poorly, and on at least one occasion with a fake countermark. These, however, were not “pseudo” marks but deliberate forgeries of important makers, and therefore always without any U.S (or other) retailer’s mark. However, you’re absolutely right that it’s difficult to fake and I unhesitatingly concur that those here and reported on other similar items are genuine. I’m surprised here, too, but that’s the great fun all this: continual surprise at discovery. I live in New Orleans and regularly catalogue/appraise old family silver and can only say that I have simply never seen it. As I say, I have definitely seen other N.O. retailers with the Minerva mark (including Hyde & Goodrich’s successors A. B. Griswold), but never H & G. Live & learn. 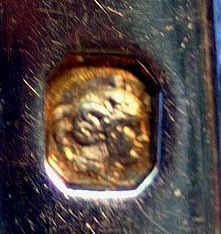 of the Mercury head mark . . . I have seen only a handful, or maybe two, of pieces which had this mark. I personally think it was not used very often. This surprises me! I’ve seen it countless times - literally dozens upon dozens - and can attest that it was, and is, used regularly, though rarely on American retailed pieces before 1880 or so. (I’ve seen it on numerous turn-of the-century Tiffany items, though, and on many Caldwell & Co. pieces, too.) However, it is only struck on items made specifically for export and its specific function is to indicate an exemption from duty. It isn’t difficult at all to see how a large French firm dealing with many overseas companies couldn’t possibly know at the time of an item’s production into whose hands it would wind up - a Parisian retailer or one on the other side of the globe – and simply choose to pay the duty on all items and pass the cost along to any overseas purchaser. That's probably because I left out a salient point. It is important to remember that the Minerva 1 & 2 marks did not guarantee merely a minimum fineness of .950 & .800 (respectively), but precisely those standards, within a tolerance of .005. So the problem is not that American .900 coin (or .925 sterling for that matter) "should always have been marked with the second standard mark" as you say, but that it could not be legally marked with either standard. French import marks, on the other hand, guaranteed no fineness whatever (at least not those before 1864); they merely indicated that an import duty had been paid. 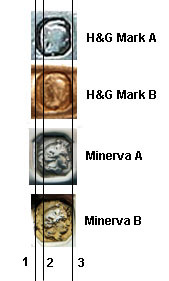 While there may have been some fudging of import/export duty and their respective marks, I cannot fathom a French Assay Office risking potential debasement of their standards by the deliberate application of the Minerva mark to items they knew to be substandard. The America-to-France argument is plausible only if W&H made the silver to the French standards in the first place, and that - I think you'll agree - is highly unlikely. I was not clear here. I was referring to the stylistic difference between Anglo-American silver and French Silver. In the 19th Century, particularly before the Civil War, New Orleans was sharply divided between the Catholic, French-speaking, laissez-faire Creoles and the Protestant, English-speaking, earnest Americans. The former viewed the latter, who arrived in droves after the War of 1812, with considerable resentment and scorn. (The city itself was divided into distinct municipalities, and the terms "French Quarter" and its old counterpart the "American Sector" reflect this schism.) The Creoles disdained American/English taste, and vice versa. The Creoles demanded French style silver, whereas the Americans wanted the English/American styles they had grown used to up North. The problem with W & H supplying H & G with French made silver is simply one of logistics. I don't understand why a former French colonial city would order its silver from France through W & H, when ships regularly went back and forth from France to N.O. I think because in a very real sense, New Orleans was not one but two cities: the old French colony and the new American one. Hyde & Goodrich - both Northerners themselves - catered early on to the American market in New Orleans. There is no doubt that most of their flatware came from the Wood & Hughes, and that their primary suppliers were from the North. It is worth noting, too, that the locally made silver by H & G was by immigrant German silversmiths, not the old French ones already here. They - the old Creole silversmiths - met the demand for for French & French style silver until the 1830s-40s. It was during this period - 1840-1850 - that Hyde & Goodrich ascended and began to dominate the entire New Orleans silver market. They were unquestionably the largest retailers in New Orleans by the late 1840s. 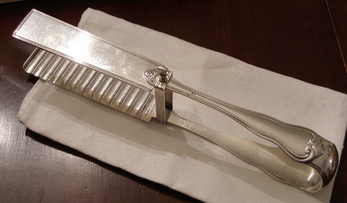 As they took over the market, it is not a stretch to assume that Creole consumers would have gone to them, and that H & G would more and more carry the French styles which had previously been the domain of the old Creole silversmiths (the most prominent of whom - Lamothe, Couvertié, Giquel, etc. - had, by the time, all become European "fancy goods" dealers/importers). H & G, theretofore having gotten by quite well on their Northern suppliers, may have quite simply turned to them for the greater demand French styles. It is also possible - I think probable - that W & H already carried some French silver independent of any demand from a lone New Orleans retailer. In that case, it would certainly have been quicker for H & G to get wares from New York than France. If, as you say, there are items with only the H & G and Minerva mark, then I don't think it's a real contradiction. H & G probably filled the local demand for French silver with expediency through Wood & Hughes when needed, and through direct import from France (probably a lower cost, avoiding W & H's markup) when time was not a factor. I certainly shouldn’t have said “never been faked”, never is a bad word. What I should have said, is you aren’t likely to find a fake. The reason is simple: the only place where a fake mark would mean much is France, the fake would be obvious, it would be confiscated and destroyed. Any chance you have a photo of the one you saw? A little off the subject, but I saw a fake 17th c. Augsburg beaker once, but I couldn’t believe it would fool anyone, seamed, etc. You really can’t spend the time necessary to competently fake one. I would think the most common method of faking is to take an unmarked item and improve its value. What was the fake Minerve mark on? What grade silver? I am not sure if I saw the Minerve mark on other N.O. retailers, I just would not have differentiated, but I specifically remember at least one set of H & G spoons. I checked a receipt for 5 spoons I sold two years ago, I noted H & G and the first standard mark, but only noted “pseudo hallmarks”, as the third set of marks, sorry. I again slipped up and should have said “antique pieces with the export mark”, on more modern pieces, I wouldn’t pay much attention. I have a French produced Tiffany tea set, I will have to check out the marks. I of course know of the variance allowed by French marks, (it would be hard to see 2 dots on 18c Paris pieces without thinking of it) but I also am not sure how, they could test accurately a previously completed piece without adversely affecting the piece. So for instance if a spoon were resold in France, how would they accurately determine its silver content without removing a lot of silver? I may be able to come up with a French piece of silver stamped with a guarantee mark, but in fact having a different quality of silver, but that will be next week. I also wonder when imported pieces were marked in France, most people presume they are marked before resale in France. I have however heard family stories (I know they are always dangerous to believe) of pieces in private hands being marked with import marks, and also some being damaged by customs agent, because they lacked such marks. I obviously misunderstood your point about styles. On the other hand you should be happy Pat Bacot doesn’t surf the net, he might not forgive you for forgetting the Huguenot French. I should say here that I am half Upper Louisiana Creole, the other half being French. I accept the plausibility of getting French pieces from New York, if speed was important, but it still strikes me as odd. I am not sure what use W & H would have in stocking French pieces outside of those to be sent to N.O. Has anyone seen any examples without H & G backstamping? I wouldn’t think a firm as big as H & G would not have plenty of French style flatware on hand and on display. I realize that after the advent of steam, items of European origin may have been ordered by clients in the US. Some years ago I found a sample case of Sheffield knives, which allowed clients to order Sheffield knives through A.J. Jordan here in St. Louis, but that was in the 1880’s. So if H & G wanted to save money, a very Creole trait, why would they go through W & H to get things from France. I suppose, before the Civil War, you could argue it was due to the triangular trade routes, but there seems to be a lot of evidence of boats going back and forth directly between N.O. and France. Of course H & G ordering French style silver from W & H makes good sense if the flatware was cheaper. I think the arguments given for the France to W & H to H & G are very convincing and it is very possible that is the answer. But, I should also say, I am not convinced. Possible, maybe, but I am not so sure I understand the period well enough to be so certain. Any chance you have a photo of the [fake mark] you saw? Sadly, no. I don't usually have the time to take photos when I do auction cataloguing or appraising; someone else's nickel, you know. What was the fake Minerve mark on? What grade silver? I do remember very specifically a small lidded jar (like the type that would've been with a traveling dresser case) with both a fake first standard Minerva and fake M. G. Biennais maker's mark. Both marks were hopelessly inaccurate (the Minerva, as I recall was nearly square and the Biennais "monkey" mark ridiculously proportioned), and there was no countermark. The piece was also very thin; I haven't had the opportunity to examine many genuine Biennais pieces, but it took only a second to realize that this silly thing was not from the hand of one of the greatest silver geniuses of the Napoleonic Age. So for instance if a spoon were resold in France, how would they accurately determine its silver content without removing a lot of silver? I think the arguments given for the France to W & H to H & G are very convincing and it is very possible that is the answer. But, I should also say, I am not convinced. I'm more satisfied than convinced, and I don't know if it can ever be resolved (but see below). Why H & G wouldn't get their silver directly from France is a conundrum, but I do think that their getting French silver from Wood & Hughes makes a lot more sense than their getting Wood & Hughes silver from France! And, to turn this all on its head, here's one final very interesting little tidbit that my digging has turned up. According to the regulation of 1840 when the Mercury's head export mark was introduced, if a maker wished to export his wares with no French marks at all, he was permitted to do so. While these pieces were otherwise required to meet the regulations regarding "assay and fineness" (i.e., they had to be tested and meet legal fineness of .800 or .950); the Mercury's head mark could be applied to a metal plaque affixed to the article with silk cord. This not only explains the dearth of early to mid- 19th century items with this mark, but also raises the very real possibility that the "French" style silver made by Wood & Hughes (and others in America) is not theirs at all but is, in fact, French! They had merely to request the silver with no marks, remove the tag, and apply their own marks. While testing to see if some French silver is not the standard marked, you might want to test French-style H & G/W & H silver without Minerva marks to see if it is either .800 or .950! I also have a fake Biennais mark, but it is so unconvincing it isn't worth mentioning. I presume you know that Biennais was really a great merchant, but not a silversmith. The last piece I saw was a camp chest with his very ornate label (I have a picture, but can't post it), but all the pieces had other silversmiths' marks. The Louvre recently had an exhibit on Biennais and published a catalog at the time. I guess one reason I am not so convinced is that I have seen inconsistencies in French marking: French pieces, with earlier marks, remarked with import marks, early pieces remarked with guarantee marks, etc. One of the import pieces I was thinking about is a set of spoons, that supposedly went over to France in the early 19th century, and came back with the same family, yet they had a French aunt import mark. I didn't know about the no mark rule, where did you find it, but that is why I suggested they should be tested in my first posting. I will try to find some of the pieces with inconsistent markings, and post them later in the week. The information regarding the Mercury’s head export mark regulations is from “Dictionnaire des poinçons de fabricants d’ouvrages d’or et d’argent: Paris 1838-1875” by C. Arminjon, J. Beaupuis et al. (Paris: Imprimerie Nationale, 1994) [Cahiers de l’inventaire #27], p. 18. I’m sometimes amused at the attitudes concerning anomalies in French hallmarks. (And please, labarbedor, don’t take this as a slam against you; your expertise and spirit of inquiry are manifestly evident. Besides, my grandmother was Creole and she’d roll in her grave if she thought I was being rude to a fellow Frenchman!) But can you imagine the harumphing and scowling and gnashing of teeth if peculiar British hallmarks were treated the same way? No, that’s always the fault of unscrupulous makers or conniving forgers or duplicitous foreign pseudo-markers or . . . well . . . something . . . but never the august and infallible Goldsmith’s Hall. Whereas with French marks, well, clearly the assayers were just sloppy or confused. Laissez les bons temps roulez, n’est pas? And finally, the first standard Minerva of 1838. In all, 7 marks, all genuine, with countermarks for 1819 & 1838! Talk about inconsistencies! But not really. The first three were struck initially, comfortably dating the skewer to 1798-1809. That the marks for 1809-1819 are missing is significant, for according to the law of 1819, any items which turned up with earlier marks – but missing the special census mark for 1809 - were to be considered unmarked and subject to testing and duty. Likewise, any piece which turned up for sale after 1838 which, by virtue of its marks, could be proven to be French but lacked the official census mark of 1838 was likewise considered unmarked and once again subject to testing and duty. I really like that my little letter opener, born in the days of Republicanism and Terror, stayed in France, passing from hand to hand, long enough to see it through Napoleon, Restoration and the July Monarchy, and bears the scars (and marks!) to prove it. I don’t doubt that mistakes took place; one of the reasons the “rabbit’s head” return mark of 1888 was introduced was the confusion the dual purpose “ant” mark had caused. But my experience has been that most eccentricities are eventually explicable. I suspect with more information regarding the set you mention (Is there documentation that the ant mark was not there when it went over? What other marks are on it? Who was the maker? etc.) then that mystery, too, is solvable. 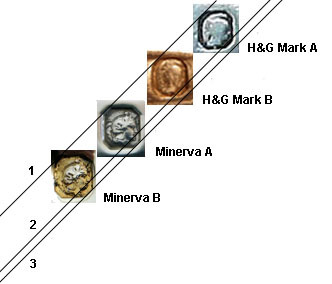 It's evident that the Minerve mark on that other H&G spoon and the one on ahwt's H&G spoon presently under discussion are a different mark from the genuine Minerve mark that swarter shows. The goddess's head is much cruder and lacks detail; it appears somehow smushed (to use a highly technical term) and flatfaced. The crest of her helmet does not have the perfect semicircle of the genuine Minerve mark. Her neck is (oh goddess forgive me!) scrawny and weak. The octagonal cartouche is less square than it should be. I have seen several other Hyde and Goodrich spoons with the Minerve mark, and they always look the same: distorted, flatfaced, lacking detail. I hate to disagree with so many eminent silverphiles, but I strongly believe that this is a New Orleans pseudohallmark. Even the bigourne looks wrong and lacking in detail. Ahwt, is there any chance of getting a really closeup picture of the Minerve (the same resolution as Swarter's pic), and posting them side by side so we can do a more detailed comparison? I think Maurice will confirm that the Minerve, like other French marks, varies almost nil from die to die and decade to decade - far less than English hallmarks, in fact. I've never seen a real French spoon with a Minerve that looks "off." Also, if this is a French-made spoon, how do we explain the apparent lack of a French maker's mark, which was required by law? Thank you for the reference to that post; it only renews my initial suspicions of the "Minerva"� mark on the H&G piece. As I say, I have never personally seen an H&G piece with a Minerva mark. I was perfectly content to assume that the French maker's mark was hidden under the Wood & Hughes stamp; clearly that is not the case in the photos you reference. So, in order to get to the bottom of this (and indulge in a little “I love a mystery” time) I took the Minerva head from that post and this and also two clear, genuine Minerva photos from my collection and re-sized them to the same scale and orientation. I aligned them vertically, drew two parallel lines (1 & 3) and resized them each (maintaining their individual size ratios) so that they each fit exactly between these lines. Then I noticed something: A vertical line (2) drawn at the join of Minerva's helmet & plume was identical on the two known genuine marks, but fell in the middle of the plume of the H&G marks. Also, the edge of the plume in the genuine marks was almost at the line 1, but in the H&G marks, it was noticeably further away. Next, I took the same photos and, without changing the size or orientation from the first test, aligned them horizontally. I drew a horizontal line (2) at the base of each mark. I discovered that not only are the bottom of the H&G marks slightly out of true, but a parallel horizontal line drawn (1) at the top of the genuine marks was considerably higher than the H&G marks. Finally (again without changing the size or orientation from either of these tests) I aligned the four marks diagonally. I drew a 45� line (1) so that the upper left canted corner of each mark was aligned. A line parallel to it (3) touched the lower left corner of both the genuine marks, but again the H&G marks fell short. 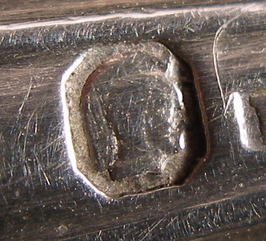 This seemed to confirm that the height-to-width ratio of the two genuine marks was not the same as the H&G marks. Furthermore, one more line (2) parallel to the others, precisely intersected the genuine marks at the join at Minerva's neck & chin and then the tip of her nose, whereas the same line intersected both H&G marks at the tip of her chin and her nose not at all. O.K., I know the H&G marks are in poor condition and the photographs were taken by different hands at different times. At the very least, here they are, side by side for comparison. I, for one, now embrace the idea I dismissed so cavalierly before: that, countermark or no, the H&G "Minerva" marks are spurious. I admit, however, that given the fact that French silver could be exported with no marks at all, the theory that these spoons are of French origin is still viable. While I have my doubts about the spoon in the post akgdc references, the one in this post most definitely appears French to me. I think only a precise assay of one (preferably more) of these items with both the Minerva/H&G marks will answer that question. I will add here that, contrary to what was said in the referenced post, I do think New Orleans Creoles would have been sophisticated enough to know about French marks. There was unquestionably authentic French silver available here (I have a pair of French spoons owned by William Freret, mayor of New Orleans in the 1840s) and the Creole disdain for things American and English was quite strong. To presume that Americans were educated enough about British marks to be mollified by pseudo-English marks while French Creoles were not similarly familiar with French marks is simply evidence of the peculiar Francophobic bias I mentioned in my last post. So what do you think? Have I just been watching too much CSI? Even with your caveats (different cameras/hands, etc) it is a very interesting analyst. I would like to see the analyst without the camera/hands caveats. Your speculation seems reasonable. I applaud the effort. Thank you. Has anyone ever done something similar with several years of Minerva marks? I can appreciate how much time and effort was involved in putting this analysis together - thank you. The spoon illustrated in the 1999 thread dug up from the archives certainly looks like an American spoon - such spoons with their tapered shoulders and oval handles were made in New York State and do show French stylistic influence. It is also clear from Blakstone's analysis that different punches were used. One must be impressed that, if the H&G spoons bear a spurious mark, the forgery is a skilled one if it requires so close an analysis to detect - after all, it is a small punch, only 2.5mm wide from margin to margin. One cannot help but wonder how nearly identical sequential genuine punches were, and what happens to discarded worn ones - they should have been destroyed, but could someone have gotten hold of one and used it illicitly? I am switching over to DSL with Bell South and in the process my phone line completely disappeared. It has just been restored and I will try to take some more pictures of the marks. Also I just received John McGrew's book and I am amazed at the clear pictures in it. I have a lot to learn in taking pictures. In the meantime, if you look just above the eagle in my earlier picture showing the eagle, W&H and the letter F there is a little mark that is quite often found on Conning pieces. Looks like a little curved check mark. This is a mark I assume indicates that Wood and Hughes was the maker. It appears of those pieces only marked Conning as well as those with the Wood and Hughes mark. It appears on other Mobile silver as well. I wonder why Wood and Hughes would put this mark on silver made in France. Blakstone mentioned briefly that German silversmiths provided silver to H&G. For those interested in reading about the German culture in early Louisiana, the Autumn 2004 issue of Louisiana Life provides an excellent start. 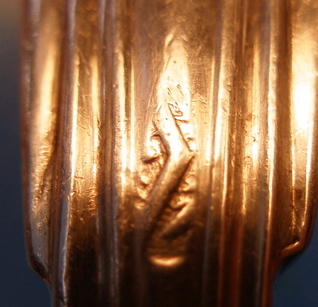 These two pictures are of the same Minerva mark on the H&G spoon taken from a slightly different angle. While hard to see, it does appear that there is a 1 by the forehead. 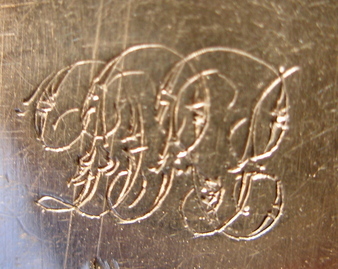 For comparison, this is a picture on a Minerva mark on some asparagus tongs. I believe these asparagus tongs to be French as they are marked with the Minerva head (with a 1 by the forehead) and on the reverse the bigorne mark. (Of course I have been wrong before) Each leg and the cross member are struck with these marks. The cross member also has the makers mark. It appears to be the letter E, a bird's head (perhaps an eaglet) and what may be the letter T all inside a lozenge. 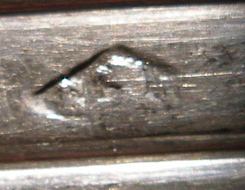 No charge or discharge mark appears although there is what may be another mark on the threaded fastener as shown below. It is too small for me to decipher, but it does look like an intentional strike. Page 65 of McGrew shows the W&H mark with the letter F. He states that the mark is for a specific customer with a question mark for the customer. In this case the customer was H & G.
To my untrained eye, the Minerva head and the bigorne mark on the spoon look right. Thanks for the great new photos!. Here is one of them side by side with a good, clear photo of a Minerva mark (one of the ones used in my little test). I'll be happy to perform more analysis, but seeing just this, I cannot help but respectfully disagree. I do not think it possible that, even in this worn state and given possible variances in Minerva dies, these can represent the same mark. I am convinced it is simply not a genuine French mark. The H&G mark has a flat neckline, whereas the genuine mark has a distinct concave downward slant. Also, the plume of the H&G mark is not the semicircular curve of the genuine mark (as was mentioned on the other post) and even given the worn state there is no evidence of any detail to the crest plume at all. Further, these photos show even more pointedly that there is simply too much space on the left side of the H&G mark. Lastly, the "1" on the H&G punch is clearly much higher than on the other mark. I agree with your analysis. With the marks next to each other the differences are understandable. I have never seen the Minerva mark as clear as in your picture and did not realize that there was a figure in the hair of Minerva. Thanks for the great image. Tardy's picture of Minerva is really not very good. Perhaps the French Minerva was where Freeman Durgin got the idea of including figures around the head of some of his medallion pieces. In Minerva's case it is not clear to me why a goddess of wisdom would have creatures in her hair, but that no doubt is another story. It is not obvious to me why one would want to put a fake Minerva mark on the H&G/W&H spoon. Perhaps someone felt it was essential to only have things made in France and another was willing to accommodate this desire even if it meant deception. Thanks also for the information about the asparagus tongs. Well I get a little virus, and you guys solve the whole thing. Relax, the virus was the personal not the computer type. As akgdc points out there is essentially no variance in Minerve marks, except of course the angle it was struck at and the wear on it afterward. I usually don't put much faith in comparing the size, etc of two marks. I had a pair of 18th century candlesticks, which for a long time I was sure were made by two different silversmiths, then I realized it was just a distorted mark. Looking at the two marks side by side, it is quite obvious, one is a fake. Having probably seen more of these (presuming they were all the same), I must admit to being rather careless viewer. I must mark it up to ageing eyes, and trust in the "belief" that the French mark isn't faked. I probably saw the mark, may have thought it odd looking, but turning it over saw the countermark and thought that the mark was just worn and or stamped oddly. Live and learn. I will still check at the bank to see if I have any examples left. I should have pointed out, that using a French pseudo hallmark on New Orleans was understandable. The example I posted with a cocq mark used here in St. Louis may well have originated in New Orleans as Bouju worked there before coming to St. Louis. The French style of silver here seems to have Americanized much faster than in New Orleans. Perhaps because the Americans overwhelmed the French to a greater extent, the market for it declined more rapidly. I cleaned the deposits from the Minerva mark I posted above (January 15), and there is indeed a "1" at the top. I later posed the question of how nearly identical replacements for worn legitimate punches might be. I am not certain this mark was struck with the same punch as the one shown by Blakstone, as there seem to be differences in the details that may not be explainable by lighting or wear. The one on the asparagus tongs is clearly different. Anticipating that someone will question the apparent absence of the figure against the helmet's "cockscomb," I went back and "tweaked" the previous image taken before cleaning, in which the contrasting background was still present. I have also copied the drawing of the bigorne used after 1838 from Rosenberg. See the explanation in my second posting of January 15th in this thread. This discussion is fascinating and may result in a book by the time you are done! Thanks. I have more mundane queston for Blacksone. What did you use to clean the minerva head? My silver polish does not do such a good job! I realize at this point someone might want to end this thread, but since the Minerva topic is still around, does anyone have a photograph (not an illustration) of the new Minerva mark introduced in 1972? I've never seen one of these. Has anyone else? Blakstone, there is quite a good copy of the 1973 Minerva mark in Tardy, 1985 edn at page 200. Well, yes. But as I say, I'm looking for a photograph of the mark, not an illustration. Thanks, though! Yes, I meant Swarter. 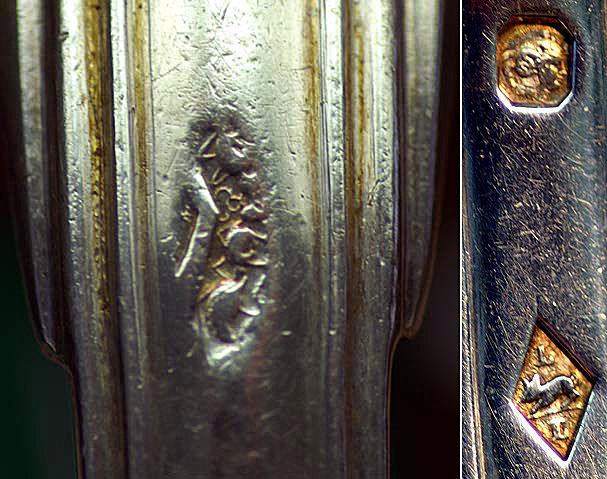 What is the best way to clean hallmarks?